A year or two ago I published a special remembrance of my mother to commemorate Mother’s Day, but neglected to do the same for my father when Father’s Day came around. I am choosing to fill that void this year. For those who choose to read this story you will find that he was a most remarkable man. 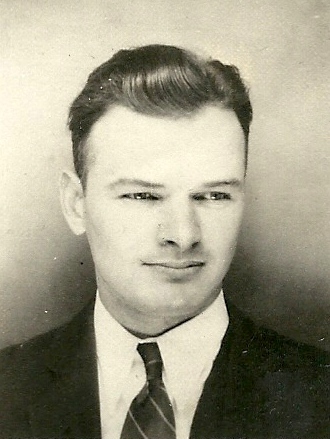 Edwin George Donahue was born in 1906 at or near Ringgold, Texas, in a covered wagon while the family was moving from a farm near Galveston north to Bonner Springs, Kansas. The only record of his birth was a notation scribbled by his mother in the family Bible. That was the only document Dad ever had after it became time for him to apply for Social Security. Dad was among the youngest of nine children in the family of Peter and Grace Donahue. Both of these grandparents passed before I was born so I never knew them. My father never spoke much about his family, or about his personal affairs, so his past remained a mystery until after his death and we got our hands on a personal biography he was attempting to get completed. It turned out that he attended high school in Bonner Springs, but suffered from a severe speech impediment. He stuttered. He later got into a special training program where he was taught to speak every word very slowly and deliberately, and to sound out each syllable. Somehow using this technique helped Dad overcome his stuttering. Looking back I suspect that training was the reason he did not speak much, but when he did, what he said was deliberate and meaningful. During his years in and around Harbor Beach he did some public speaking, taught Sunday school classes, and later taught high school classes in the Peace Corps. Mom said that once, when he returned to Bonner Springs for a class reunion, Dad began stuttering again, just for the time he was with his old classmates. When he was young, Dad developed a keen interest in chemistry. When they moved into one house where there was a spare room in the basement, he used this room to conduct chemistry experiments. He apparently knew at a very young age what he wanted to do with his life. He later attended Kansas State College then moved to Michigan behind two of his older sisters and their husbands. He got his master’s degree in chemistry at Michigan State College. He earned his way through college painting barns, picking strawberries and doing other farm labor jobs. Once at Michigan State, he worked his way through as an undergraduate assistant. Mom and Dad decided they wanted to get married, but Dad had to have a job before they could afford it. He hitch hiked from Lansing to Harbor Beach in 1935 to land his lifelong job at the plant in Harbor Beach. The old Huron Milling Company made wheat starch and other food products, including monosodium glutamate, later found to be an addictive excito-toxin that destroys brain cells. It is ironic that a portion of the old plant was later sold to the Searle Company and used to manufacture aspartame, an artificial sweetener that was found to be just as addictive and as dangerous an excito-toxin as monosodium glutamate. Dad had nothing to do with developing these products, although he did find a less costly way of manufacturing MSG, which helped make the company a lot of money. Dad was involved in the development of packaged dried food for troops during World War II. Because of this important work for the war effort he was exempt from the draft and did not go off to war. He also invented meat-flavored bullion cubes used to make instant broth and gravies. They are still being sold today under many different labels. I remember that my parents were involved in a bridge club, a book club, a square dance club and various other events that kept them socially active about town. Sometimes they hosted the bridge club gatherings and we children were whisked off to bed early. Of course we sat at the top of the stairs quietly watching the going-on through the railings. Card tables were set up all over the house and adults were seated, four to a table, everywhere we looked. Dad was a constant hobbyist. His earliest interest was photography. He owned a classic 35-millimeter Argus C-3 and set up a darkroom in the pantry off from the kitchen of the house on South Huron Avenue. Consequently, there were hundreds of pictures of “little Jimmy” in the box of family pictures. By the time Andrea and Steve arrived, Dad was off on his next big adventure which was radio. Consequently there were less pictures of the other two children in the photo box. Dad’s radio hobby involved building radios, testing them, building testing equipment, and very soon, because the war was on and people couldn’t buy new ones, he was repairing radios. Those early radios had vacuum tubes in them. Dad’s next hobby was obviously the farm. Mom and Dad bought the 160-acre farm on Filion Road near Port Hope in about 1948, right after the war. His original plan was to make it a tree farm and he set off on a major tree–planting campaign. He bought an older Ford-Ferguson tractor with a hydraulic lift on the back. On this he put a box that he filled with small trees. I helped him as we moved the tractor down a row. Dad used a square planting shovel to push aside a crack in the earth while I dropped the roots of the little trees in each hole. Then we heeled in each tree, poured water on the sapling and moved on. He planted acres of jack pine, scotch pine, white pine, and possibly a few other varieties. We soon discovered that farmers in Michigan shared an obligation to maintain fence rows. That meant that on the boundaries of the land that we owned, it was our duty to maintain half of the fences surrounding it. Most, if not all of our neighbors to the east, west and south of us kept cattle on land adjoining our farm. Thus we learned how to dig post holes, set fence posts and string barbed wire. We usually did it in the early spring, but sometimes got caught in mosquito season. I remember working with Dad on one fence that went deep into a wooded area laced with biting insects. It was so hot that weekend that the mosquito repellent drained off with our sweat. It was one of the most miserable jobs I have ever worked on. For Dad, the farm became his playground when he was not in the laboratory. For him there was no more time for bridge club or other social events. He spent every spare minute of his time working on some project on the farm. For me, as a young man, it was a learning experience. I worked with Dad on many of his projects. We bought equipment and used our tractor to work the soil and plant all kinds of crops. We grew wheat, oats, rye, navy beans and alfalfa. We had a threshing crew on the farm one year to harvest the beans. The rig was set up in the barn which was a mistake. They generated so much dust that the barn was too dirty to use for much of anything after that. After that Dad hired his harvest done by combine. One year he almost bought a used combine, but decided the return from the investment would not be worth it. That was a wise decision. We hardly knew how to service and maintain our tractor. A used combine would have been a disaster. There was a waste product at the Huron Milling Company that was a black, tarry, stinky material that they called “sauce cake.” For years the company disposed of this stuff on a vacant lot just outside Harbor Beach. It smelled so bad that people living in the area complained. Dad discovered that the material was full of nitrogen and other materials that would make good fertilizer. He decided to use our farm for an experiment. He had a manure spreader especially adapted to handle sauce cake which had a consistency of mud. Then he had a truck load of the stuff delivered to the farm. He picked a place back in the woods where it would be out of sight and out of mind. He spread this material in marked strips across one of his fields then planted a crop of wheat using regular fertilizer all over the field. When the harvest came in that summer, the yield on his regular field was about thirty bushels to the acre. Where he spread the sauce cake, it jumped to 50 bushels to the acre. When the neighbors saw how his experiment turned out, they all wanted sauce cake on their farms. If they could stand the smell it was free fertilizer. Dad developed amazing strength during the years he worked that farm. I once saw him pick up a giant log that had to be about two feet square and about 50 feet long, and drag it several hundred feet because it was in the way of space he wanted to use to expand his lawn. Dad also refurbished the old farmhouse. When he bought the place, the house had no plumbing and the wiring was so old the ceiling lights had to be turned on by pulling a chain. The house had about four chimneys with coal or wood stoves attached to each. There was a cistern under the kitchen. Water was pumped from the cistern by a hand pump into a wooden box that served as the kitchen sink. We drew our water from a hand-dug well just outside a door leading from the kitchen. A few feet beyond this was the outhouse. The well water tasted terrible and I refused to drink it. I reasoned that the outhouse was located too close to the well and the water was probably toxic. Dad said he had it tested and insisted the well water was safe. He must have been right because nobody ever got sick from the water. We just didn’t drink much of it. There were two bedrooms downstairs and two finished bedrooms upstairs. To get to the upstairs bedrooms we climbed a steep staircase leading off from the kitchen into an unfinished attic, then walked through that to reach a finished hallway at the west end of the house. This opened into two finished upstairs bedrooms. We spent several years turning that old place into a beautiful home. It was an amazing learning experience for all of the family. When we were finished there was a downstairs bathroom, a modern kitchen, a dining room, downstairs bedroom, a large living room with a beautiful limestone fireplace, a new staircase that opened up into a finished room that sometimes served as a spare bedroom. Another wing of the attic was finished as another bedroom. Thus we had a four or five-bedroom house. We tore out walls, hauled away old lathe and plaster, installed plasterboard, layed hardwood flooring and painted. We hired one of the last men in the area that knew how to plaster homes and he did a beautiful job. We also hired the electrical and plumbing work. The plaster guy also built our fireplace and the chimney that served it. Dad was a fanatic about gardens and lawn. He had large ones. It was my job to mow the grass and hoe the gardens. I always knew how I was going to spend my summer vacations on that farm. Because of his super vegetable gardens and the fruit orchard on that farm, however, we always ate well. We had one of the first televisions in the rural part of Michigan at our house. The nearest television station was Channel 6 in Lansing, with the second nearest in Detroit. Both stations were at least 150 miles away. Dad brought home a new Philco Television set and put up a super tall antenna from the peak of our roof. The antenna was as tall as the house, so it could be seen for miles. Our house became a marker for the neighborhood. When the antenna was turned just right and when weather conditions were good, we received a television signal. It was usually always snowy and sometimes the sound faded in and out, but it was real television. When we got really lucky we got to watch Your Hit Parade, The Kraft Music Hall, Jack Benny, George Gobel, and other early classic television shows. Dad continued to experiment with raising bigger and better antennas. After television stations opened in Bay City and Flint, our reception got much better. Dad contracted with the Michigan Highway Department to sell gravel from a run of gravel found on the west edge of our farm, on a hill overlooking a small stream. We had large dump trucks thundering past our place all one summer as the new highway between Harbor Beach and Port Hope was being built. Filion Road was still a gravel country road then, so we lived in constant dust. I think the money Mom and Dad received for that gravel was ample reward for the inconvenience, however. When Dad hit age 65 he was forced into retirement. He was not prepared for that. He had led such a busy and active life he could not imagine not getting up and going to work. He and Mom signed up for the Peace Corp, but found out there was a waiting list. So they signed up as Volunteers in Service to America (VISTA), and moved to Iowa where they set up “meals on wheels,” congregate meals and other programs for senior citizens. They remained in Iowa a third year teaching new VISTA volunteers their jobs. After getting back on the farm, Dad launched a vigorous campaign to reroof and repair all of the old buildings on the farm. He also expanded his yard to include the orchard. Then he and Mom got a call that they were, at long last, accepted for the Peace Corps. They accepted the call and went this time to Fiji, where they both worked as teachers in a school for the children of American missionaries. After a two-year stint with the Peace Corps, they took a gala trip around the world while slowly making their way home. After returning to the farm, Dad got restless again. He opened an income tax consulting office in Bad Axe and ran that for a while. His age appeared to be catching up on him, however. One day, on his way home from the Bad Axe office, he fell asleep at the wheel and drove his car into a deep ditch. He was not seriously hurt, but the car was a total wreck. He decided at last to retire. By then the value of his farm property was growing, new state tax laws were weighing him down, and even leasing out the farmland to the neighbors was not covering the taxes paid on the property. He sold the farm, held an auction on all of the contents, and he and Mom moved to Kentucky. They bought a rural modular home that needed a lot of repair. Dad hired new plumbing work done, and got hooked up with a community water system that went by the place. But he decided to build a garage for his car and a pickup truck he bought. He had a mild heart attack troweling the concrete floor and was rushed to the hospital. He recovered and was back to work within a few weeks. He and Mom adopted a little dog that brought a lot of joy into their lives. I do not remember its name. They would go for long walks down their road with that dog every day. Mom collapsed on one of those walks. I think she had a stroke. She went downhill after that. My brother Steve and sister Andrea decided they needed to move into assisted living housing, found a place for them in Albuquerque, New Mexico, where Steve was living, and moved them there. They said the hardest part of that move was giving up their dog. Mom died shortly after they arrived in New Mexico. Dad lived on, spending much of his time with Steve and Paula. He died in their house at the age of 100. These were just the highlights of my father’s life. Much more could be written about his accomplishments, his service on the Harbor Beach School Board, as a lay minister for the United Methodist Church, and as a lover of good literature. He was especially fond of science fiction. Our house was full of books and magazines. Because of his influence, we all had our noses in fine literature, news magazines and newspapers much of our spare time. Before television people actually had time to do those things. Dad had peculiar quirks. He was constantly correcting us when we misspoke, using bad grammar or an improper adjective. That may be why I adapted so easily to writing even though I always hated studying grammar. I just knew the correct way to say or write a sentence. Dad had an amazing ability to come home from work and fall instantly asleep in a chair, then wake fully refreshed a short time later and go for many hours more. I used to think this ability was something he learned when he was training to stop stuttering. It was almost as if he practiced yoga. Dad’s one great fear, I think, was of growing old. I remember as a child hearing him say that he wanted to die young and that he hated the idea of getting old. Throughout his life he worked hard, went out of his way to stay fit, and resisted any association with elderly people. After they sold the farm, Mom wanted to move to Florida near where her sister was living. Dad would not consider it because he said he didn’t want to live with a “bunch of old people.” He was in his late 80s at the time. Dad lived to celebrate his 100th birthday. By then he was in a retirement home in Albuquerque, New Mexico. He died in his sleep at Steve’s house after attending a movie.